Triple Q Itnernational Company Ltd. The company is privately held and our main concept is to distribute the fresh quality flower and the most reasonable pirce for our customer. Directly from farm, with the freshness, we serve our customer the best quality flowers with the up-to-date technology. We are looking forward to expand our market worldwide and are looking forward to serve you all. Lucky Bamboo likes the damp heat, shade, water logging, are rich in strong fertilizer strong, strong cold; like semi-shade environment. Suitable for growing in well-drained sandy soil or semi-alluvial clay and silt, the optimum growth temperature is 20-28 °C, can be resistant to 2-3 °C low temperature, but the winter to prevent frost. Hot and humid in summer and autumn seasons, the growth is very beneficial for lucky bamboo, is the best period of its growth. 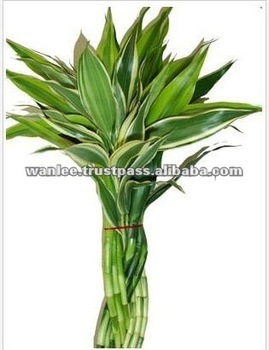 Strict requirements of its light, suitable for growing under bright light scattering, light is too strong, exposure can cause leaf yellowing, chlorotic, slow growth and so on. LUCKY BAMBOO, according to Feng Shui masters, it is believed to bring good fortune wherever it is placed, and because it can take lucky to person. So it is also named "lucky bamboo", a traditional belief that different arrangements will bring different good fortunes. Single Bamboo attracts "GOOD LUCK"
Company Name Triple Q Itnernational Company Ltd. The lucky bamboo can survive in many indoor conditions, but indirect lighting is best as direct sunlight can cause the leaves to turn yellow and burn. Although it grows better in soil, it often is sold with the roots in water. The water should be completely changed every two weeks. The water should be bottled water, soft tap water with very little fluoride, or even water from a filtered, established aquarium. It does best in bright, indirect lighting and temperatures from 15° to 25° (59° to 77°). Yellow or brown leaf edges may be caused by too much direct light, crowded roots, or fluoridated or chlorinated water, the latter of which can be prevented by leaving tap water exposed to the air for a day before plant use. Salty or softened water can also cause this. Twisted shapes can be produced by rotating the plant with respect to gravity and directed light sources. This is difficult to achieve for most home users, but not impossible with a lot of spare time and a lot of patience. Often in large chain pet shops it will be sold as an . While it will live for months like this, it will eventually rot unless the sprouts are allowed to grow above the surface. Cut stems are re-inspected, carefully packed. And then put into cool storage before the short trip to the airport. Good packing helps to keep the plants fresh longer. For best quality the stems should be removed from their boxes within two days of arrival and kept at 12-14 C (=55F). Our company theme is quality. Our experienced staffs are experts in selecting the best quality plant for the satisfaction of our customers and yours.